November 9, 2018 — Many of the stu­dents attend­ing Snyder‐Girotti Elementary School have vet­er­ans in their fam­i­lies and because of that, are aware of the ded­i­ca­tion, com­mit­ment, and sac­ri­fice will­ing­ly giv­en by our mil­i­tary per­son­nel. For this Veteran’s Day, and cen­ten­ni­al com­mem­o­ra­tion of the end of World War I, stu­dents brought in pic­tures of their fam­i­ly mem­bers in uni­form and a beau­ti­ful dis­play was cre­at­ed. 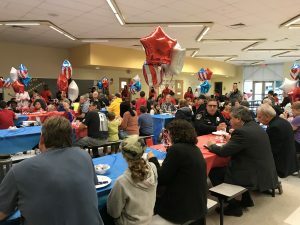 This allowed the stu­dents to share the sig­nif­i­cance and impor­tance of Veteran’s Day with their peers, and pro­vid­ed a won­der­ful cen­ter­piece for their planned break­fasts. The stu­dents invit­ed local vet­er­ans, from var­i­ous branch­es of the mil­i­tary, to come join them for break­fast. Children in grades K‐3 par­tic­i­pat­ed on Thursday November 8, 2018 and those in grades 4–6 repeat­ed this with a dif­fer­ent group of vet­er­ans on Friday, November 9, 2018. 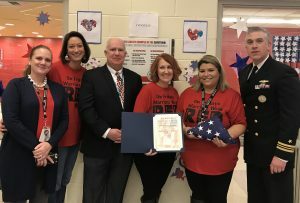 They stood with the hon­ored vet­er­ans to recite the Pledge of Allegiance, pro­vid­ed each vet­er­an with a spe­cial American flag pin, and shared sto­ries and poems they had writ­ten. The stu­dents spent time show­ing their guests the dis­play of their fam­i­ly mem­bers who have served, prompt­ing sto­ries by sev­er­al of the vet­er­ans about their time in the mil­i­tary. Special atten­dees includ­ed Representative Brian Fitzpatrick’s (R‐PA 8th dis­trict) office’s Chief of Staff, Mr. Michael Conallen. Mr. Conallen is a Navy Veteran who pre­sent­ed the school with a flag that had been flown over the White House. Also attend­ing were Dr. Tom Shaffer, Superintendent of the Bristol Borough School District, Bristol Borough school board mem­bers includ­ing Mr. John D’Angelo who is also the President of the Bucks IU Board of School Directors, and the Bristol Borough Mayor, Mr. Joe Saxton. The sig­nif­i­cance of atten­dance by these guests was not lost on the stu­dents, as the fact that such impor­tance per­son­nel would take the time to stop at their school to share in this, helped the student’s grasp the sig­nif­i­cance of mil­i­tary ser­vice, and this spe­cial day. In hon­or­ing our ser­vice men and women, those in active duty were not for­got­ten by these young stu­dents either. The chil­dren col­lect­ed 8 large box­es of sup­plies to ship out to those cur­rent­ly deployed. Included were items such as puz­zle books, hygiene prod­ucts, pens and writ­ing sup­plies, bat­ter­ies, snacks, and gum. The efforts put forth by these stu­dents, under the direc­tion of Amy Austin and Kelly Ware‐McGovern, knew no bounds as they worked togeth­er to cre­ate a spe­cial and mem­o­rable day for those who have, and are, serv­ing our coun­try. Funding came from sales of t‐shirts by the stu­dents in sup­port of RED; Remem­ber Every­one Deployed. The mon­ey raised was then com­bined with gen­er­ous dona­tions from Keystone Bagel (Bristol), Dollar Tree (Bristol), BuxMont Bouncers (Doylestown), Source4Nurses, the Bucks County Intermediate Unit, and the Bristol Borough School Board.